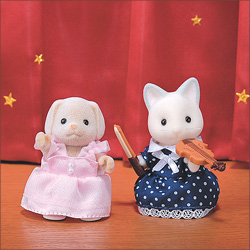 Constance & Carlotta can't wait for Monday evening to come around, because that is when they have their weekly music lesson, which they just love. The two girls are taking lessons in singing and playing the violin but, as they only have one violin, they have to take it in turns to play it while the other sings along! They take their music very seriously and always dress up for the lesson in their favourite dresses and best shoes!